Mark Ridgers credits his turbulent seven-year spell with Hearts as being the making of him ahead of his return to Tynecastle with Caley Thistle in the Betfred Cup tomorrow. 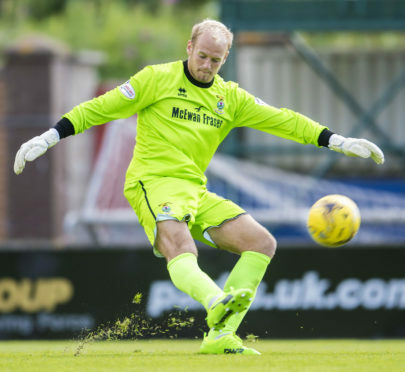 Goalkeeper Ridgers left Ross County at the age of 16 to join the Jambos for a £40,000 fee in 2007, at the height of the Edinburgh club’s spending under Lithuanian owner Vladimir Romanov. Although Hearts enjoyed some success, winning the Scottish Cup with a sensational 5-1 victory over Hibernian in 2012, Romanov’s era included various instances of player unrest, with the mounting levels of debt eventually forcing the club into administration in 2013. Although Ridgers left to join St Mirren the following year, the 27-year-old feels his mixture of experiences with the Jambos were invaluable in his development. Ridgers, who will play his first match at Tynecastle since departing the club tomorrow, said: “I joined in 2007, when they had just come off winning the Scottish Cup. “The club was on a high. They had world class players like Rudi Skacel and Laryea Kingston. At the time, they were trying to compete with Celtic and Rangers. “For the first couple of years, we’d finish in the top three and got into Europe but then the problems came off the field. That period coincided exactly with when I was there. “I was affected by the administration side, where we weren’t being paid for two or three months. Then we were getting paid in installments and, behind-the-scenes, players were coming in left right and centre. “With the Lithuanian aspect, it was a bit chaotic – but it was fun with plenty of stories. “I played there nearly eight years in all and there were about 12 managers. At one point there were two first team managers – one saying one thing and the other another. “There were massive divides in the squad with Lithuanians and Eastern European guys on one hand and Scottish guys on the other. “It was a big learning curve. Being in that environment, coming out of it you don’t realise just how normal everywhere else is. “But from a personal point of view it was a fantastic club to be at, to develop at and in terms of getting the chance to play Premiership football. “In terms of progress, the players I got to train with and coaches I had were top class. I’m very grateful for that. Inverness will qualify for the second round of the competition if they secure at least a point, and Ridgers is hopeful his side can rise to the occasion, adding: “If you’re playing professional football, if you can’t get up for games at Tynecastle, Ibrox or Parkhead you’re in the wrong game, it’s as simple as that. “We have been on a great run coming off the back of last season, so there’s confidence in the lads.